In a large bowl, mix cream cheese, sugar, 1 tablespoon milk and peanut butter until smooth. Gently stir in 1 1/2 cups of whipped topping. Spread mixture on bottom of pie crust. In a second bowl, stir pudding mix with 2 cups milk until thick. Immediately stir in remaining whipped topping. Spread mixture over peanut butter layer. Scatter peanut butter cups over top of pie. Cover and refrigerate for 4 hours. 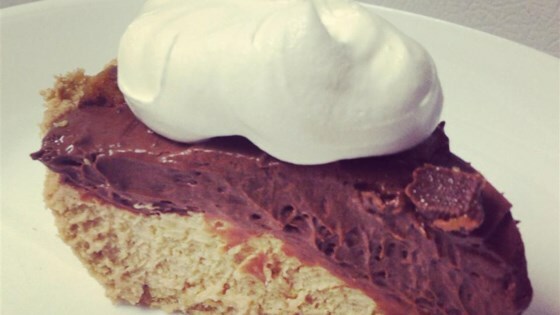 I was looking for the perfect peanut butter and chocolate pie and found it! I sprinkled crushed up frozen peanut butter cups over the top.